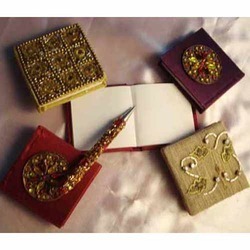 We are manufacturer of Beaded Note Books, Diaries, Autograph books etc. Very elegant and attractive artwork of hand embroidery beaded and sequence work. Under the meticulous supervision of our highly skilled professionals, we are providing high quality range of Lac diaries With Pen. This is absolutely a great corporate gifting new year 2017 product. We are engaged in custom designing & manufacturing premium quality of business organizers , Call us to know more.